...Generac & Agriculture Solar-Diesel Hybrid Generators Increases Efficiency, Lowers Cost of Gas and Maintenance. Agriculture Energies provides a full package for powering your irrigation of any size. If you want to use your current power system and supplement solar energy, we retrofit the existing pump. This means that we can use your existing infrastructure by adding our system. By doing this we minimize costs and installation time. In addition our system works with generator or sun energy, so that you can use your pumping system at night by automatically switching the system to the genset power source. Additionally our system is open and is customized to maximize your conditions as they change. We say with confidence, we have been providing this irrigation power, easier, quicker and less expensive than any other source. There's no such thing as "one size fits all" when it comes to irrigation generator power for your fields. Generac and Agriculture Solar have a variety of options to meet the specific needs of your business. On-site diesel fuel is the traditional choice for standby power. But it's hardly the only choice. Agriculture Solar’s hybrid system takes the best of both worlds. With Generac also manufacturing generators that run on natural gas and propane fuel, Agriculture Solar is also able to retrofit to current systems are create a new. This choice of fuels adds to the flexibility you have in choosing a standby power system that is the best fit for your business. 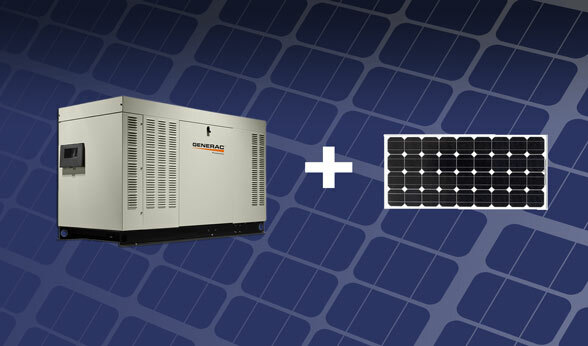 At Agriculture Solar, Generac Generators and Agriculture Energies can be your simple solution.